Knorr® Selects™ sides are made without any artificial flavors or preservatives, and are gluten free! Our hearty Asiago Cheese & Cracked Black Pepper expertly blends rice with asiago cheese and cracked black pepper into a savory rice dish. Asiago Cheese & Cracked Black Pepper is rated 4.3 out of 5 by 317. Rated 5 out of 5 by tiosefa206 from Knorr Selects Usually for dinners, my wife and I like to eat plain rice with our meals. 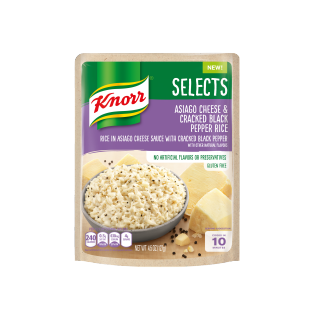 So last night, I decided to mix things up a bit and try out Knorr Selects Asiago Cheese & Cracked Black Pepper. My kids are usually the ones who don't like to eat rice and can be picky at times when it comes to food. As I was dishing up dinner, my kids seemed to be interested in trying out the Knorr Selects and asked to have a scoop to try. They immediately expressed how delicious it was and asked for more. Before I knew it, the pot I had made was finished. Due to their reaction and how much they loved the Knorr Selects, this will definitely be part of our future meals. Rated 3 out of 5 by Rachelam from Decent Product I was intrigued by this product and decided to make it for dinner tonight to go with a steak. The cooking time took nearly double that than what the package stated. It said it would take 10 minutes after mixing the ingredients together (rice and flavorings, milk, water, and butter) and brining to a boil, but it took me nearly 20 for the liquid to absorb and the rice to become tender. I thought the parmesan flavor wasn't too overwhelming, as can sometimes happen with parmesan. I also thought the balance of pepper was good. I enjoyed it, but I am not sure if I will purchase again. If you like parmesan and a quick side dish, I recommend this, though! Rated 2 out of 5 by ejayem from Black Pepper and not much else I love black pepper and add it to just about everything I cook but the pepper in this was taken to the extreme. There was barely a hint of Asiago flavoring. I think if there was more cheese added, the flavor would have a much better balance. The pepper was way too intense for my 6 and 8 yr old children; they did not like anything about this. Overall, I give it an "OK." The directions say to add milk to the water and bring to a boil; I knew doing this was a mistake but I did it anyway and ended up having to clean my stovetop of the overflowed milk. All in all, I'd say if you're willing to spruce this up a bit (and if you love black pepper), this is worth a try. Rated 5 out of 5 by andrea_ca_16381436 from Excellent product and a good price Excellent product and a good price. Look for the coupons. If you have not tried "prime pantry" yet, you are missing out. Not only is there a great selection of products, it actually saves you money by keeping you focused on your shopping list and prioritizing the items. One of the biggest expenses for my family is buying as many items on impulse as we do our shopping list. Prime pantry removes the temptation of buying items, buy color, packing, or other sales gimmicks. It also has a very cool calculator that tells you exactly how much room is left in your pantry box and makes excellent suggestions for what to fill it with. Try it, you won't be disappointed.